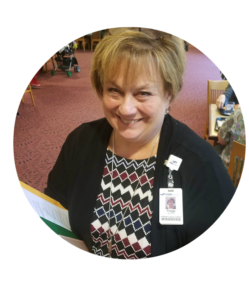 Peggy McArdle, RN BSN, Director of Service Excellence and Organizational Development at SSM Health Agnesian, enjoys guiding facilitators and offers the following as wisdom for those who are beginning their journey as a MDBD formation facilitator. Remember that you are a part of the team and are learning too. We may not have the answers but will explore with the rest of the group. You don’t have to do it all yourself…work with your co-facilitator and give group members the opportunity to share in some of the preparation. Send out a reminder along with the agenda for the conference call/in-person meetings so folks have time to ponder the questions. Pull together a short gathering prior to the start of each session to get folks in the spirit of the program. Be mindful of the workload that some group members may be handling might inhibit participation in a particular session. If someone is struggling with the daily readings or attendance, work with them to come up with a solution that works for them; perhaps catching up 2 days a week, beginning their day with the reflection while their programs load, etc. Take care of yourself as well; attend the LFP facilitator retreats offered as able; they are rejuvenating and help to keep us energized. MDBD facilitators work closely with LFP managing partners throughout the implementation of their local formation program. They receive training, ongoing coaching and spiritual formation to enhance their professional development. Bridget Deegan-Krause is co-founder and managing partner of Leadership Formation Partners. A board certified chaplain, Bridget has served in ministry leadership for over 25 years in Catholic institutions of healthcare and higher education. As a formation consultant and retreat facilitator Bridget provides ministry leadership formation with professionals in a variety of settings, with a focus on developing mission-oriented and spiritually grounded leaders for the future.